Saga Matsuri Festival is a long history festival. 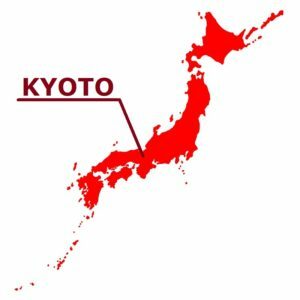 The three festivals of Kyoto’s representative “Aoi Festival”, “Gion Festival”, and “Jidai Matsuri Festival” are called “The Three Major Festivals of Kyoto”. However, there are opinions that this Saga Matsuri festival is more suitable than the “Jidai Matsuri Festival” which was founded in the Meiji era and has a shallow history. The Saga Matsuri festival is also said to have been recorded in the diary of court noble in the late Muromachi period (Sengoku period), and it was already done in the Kamakura period. There are many unclear points about the origins of this festival, and in recent years there is also a theory that it originates in the Heian period. Also, a copy of the stunning “Saga Festival picture scroll” painted in the Edo period is exhibited at Seiryoji Temple. 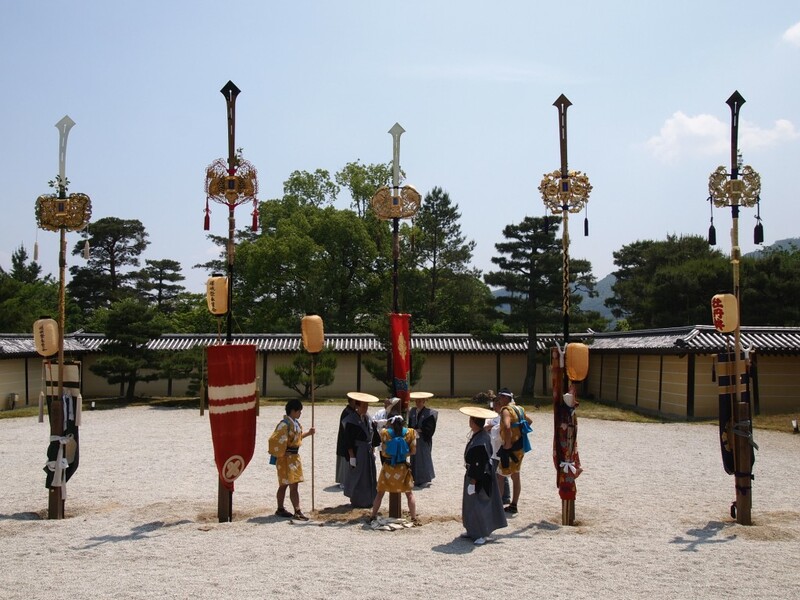 One of the highlight of this festival is a kenboko (decorated spear-like poles) that makes the clear sound echo. 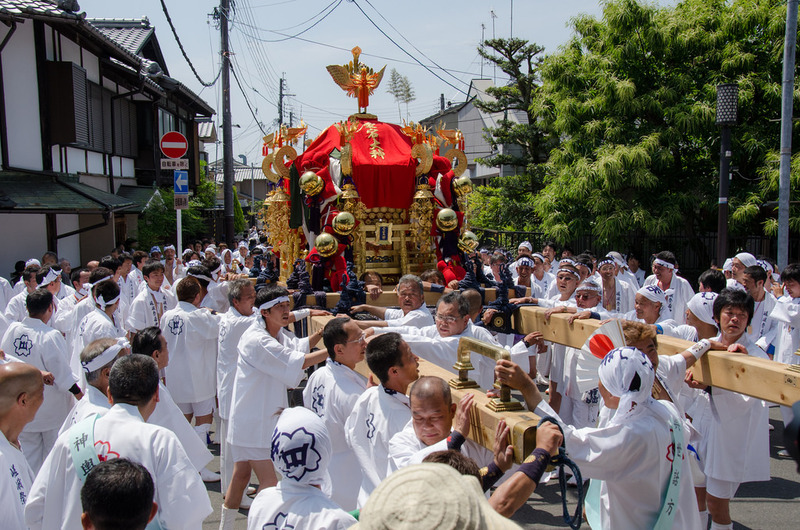 kenboko is the sound and sharp point of the sword, collecting the evil spirits that bring disasters, purifying the roads that the mikoshi (portable shrine) goes around. In other festivals in Kyoto, kenboko is ringing while swaying up and down in walking motion, but kenboko of Saga Matsuri Festival is a left and right twist, which is characterized by turning the bell like turning it around. This kenboko is designated as an intangible cultural asset of Kyoto city, and it is likely to convey old form. Kenboko itself weighs dozens of kilograms and it is hard to just lift. Moreover, the way of swinging Saga Matsuri festival is more difficult than swinging up and down, requiring a considerable skill. It is very impressive how the men who have muscles of the legs feeling stubborn walking with the sound echoing. 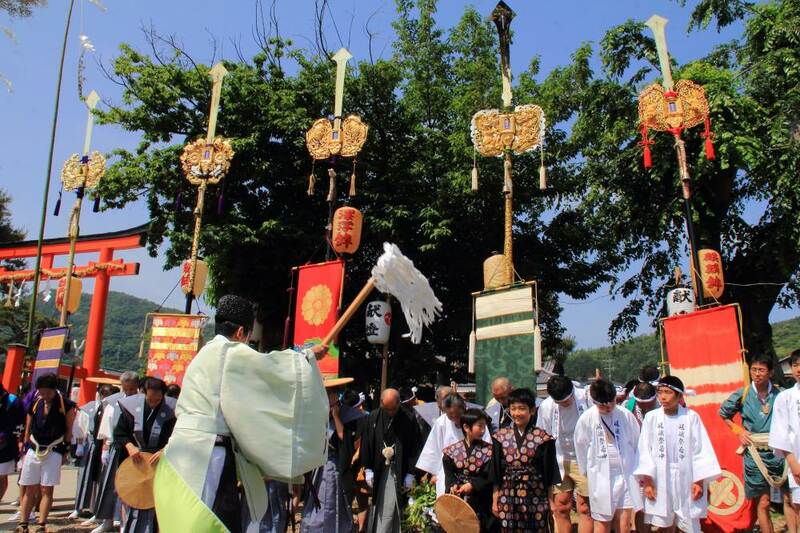 Although Kenboko is supported by the efforts of people in the local town, it was said that the kenboko of Saga Matsuri Festival is maintained not by one town but by multiple towns. 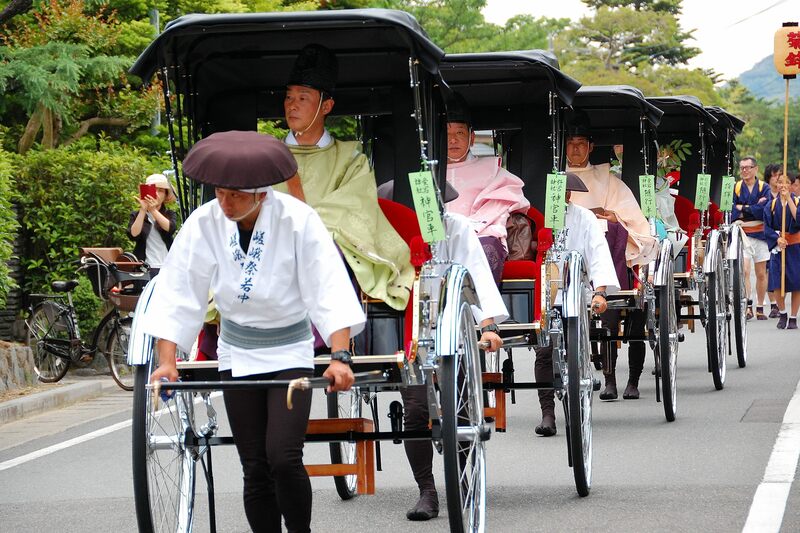 The Saga Matsuri Festival is the festival which has been told that it was taking place since the Kamakura period. It is held every May as the festival of the Nonomiya-jinja Shrine and the Atago-jinja Shrine. The Nonomiya-jinja Shrine is located in Ukyo-ku, Kyoto-shi, and it is the shrine that has a benefit to children. And Atago-jinja is also located in Ukyo-ku, Kyoto-shi, and it is the shrine that is believed as “Hibuse no kami” (god of fire prevention). The highlight of the Saga Matsuri Festival are divided into two main parts. Shinkosai Festival and Kankosai Festival. The Shinkosai is held at otabisho (a place for portable shrines to rest). In the Kankosai, the mikoshi of both shrines goes round. The Shinkosai is held on the third Sunday in May, and the Kankosai is held on the fourth Sunday in May every year. The Kankosai is a recommendation at sightseeing. 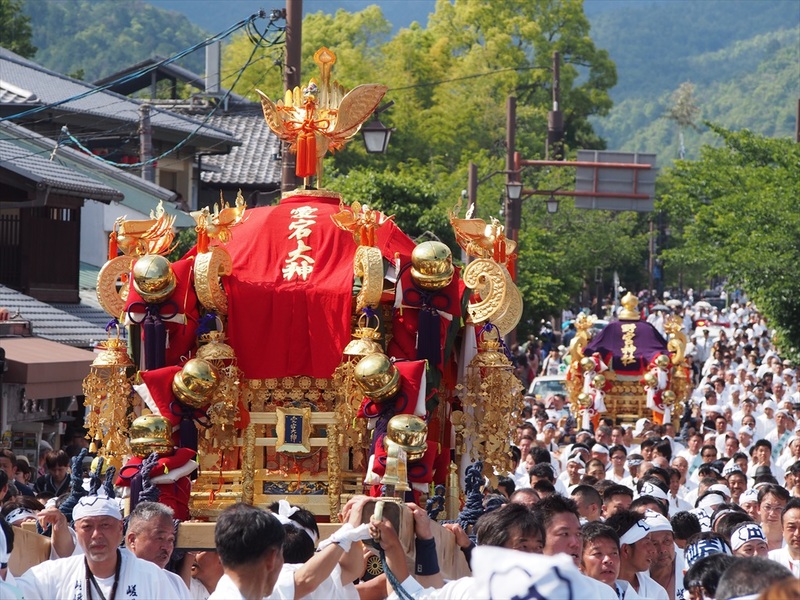 In the Kankosai, the large procession parades to Daikakuji Temple and the Togetsu-kyo Bridge. It is a must to see Kenboko (decorated spear-like poles) and Shishimai (lion dance) walking around Arashiyama and Sagano. Kenboko, which is said to be 6 meters in length and 40 kg in weight, seems to be preparing to clean up the roadside and prepare for the mikoshi (portable shrine) to go through. It seems to be heavy obviously and, seemingly, it seems to be difficult to balance very well, so depending on the bearers, there seems to be a possibility of collapsing the balance a bit. On the day of the festival, Arashiyama and Sagano area are full of vibrancy. By visiting you will be fine and get exciited. The Saga Matsuri festival is the festival in character with Kyoto. Those who wish to visit Kyoto, please look at this festival by all means.